Here is another figure which my fellow Hawaiian expat, James (Kimo) had unpainted for a few decades. I picked it up yesterday when I dropped off the Poniatowski figure. Jim has mass quantities of unpainted lead - from 15mm to this 77mm (approx.) figure. It looked so cool sitting on the shelf that I told Jim I'd like to paint it up for him - to which he agreed. So here he is after simple block painting and staining with Minwax - and highlighted over a Testors Dullcote finish. 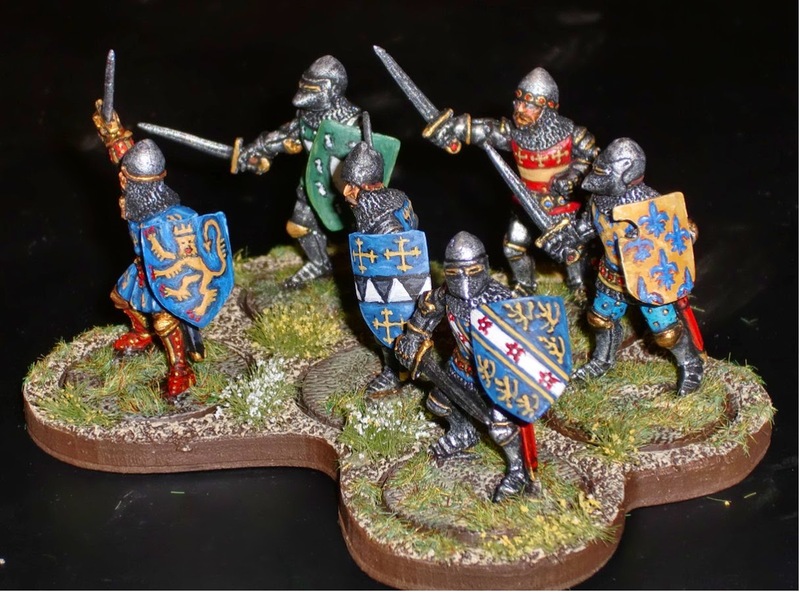 Series 77 was a leading military miniatures company back in the day. Although by today's standards, it lacks some of the more intricate details of modern sculpts - they have a charm all their own. The two-tier base was/is a trademark of the line. I'll let Jim finish the base - as well as adding the sword and scabbard which he couldn't find yesterday. The helmet is of the type called (by modern-day historians) Chalcidian. It is similar in appearance to the fully enclosed Corinthian type, but with separate check pieces. The shield is the Boeotian type with cut-outs at each side. The picture below shows the figure amongst a couple of 120mm resin figures, as well as a 100mm Spartan to which I added extra limb and groin armor; a 28mm 1st Corps Hoplite is also placed next to them for scale reference. Painted this figure up today for my fellow ex-pat Hawaiian buddy, James (aka Kimo). It is a 75mm metal figure which he must've had for sometime, as the manufacturer - Chota Sahib, has been out of business for decades. It's a nice enough figure, but I found some of the details, like the lacing on the collar and cuffs, sculpted in rather low relief. In fact, some 28mm figures have details easier to pick out with the brush. I ended up giving it a quick block paint job followed by Minwax staining. After I sped up the drying process with a hair dryer I gave it a shot of Dullcote and gave it some highlighting and details. It ended up pretty nice and have no problem letting Kimo know it's done. The prince himself was quite an interesting character and lived up to his noble heritage. As a youth he served as an Aide-de-camp in the war against the Ottoman Empire. He eventually served under Napoleon and survived the Russian Campaign. He was made a Marshal of the Empire for his heroism at the Battle of Leipzig. While covering the retreat he drowned while attempting to cross the White Elster. This is what the figure looked like prior to staining; a fairly simple paint job with only a few colors. Note the broken blade; fixed afterwards. A lot of the details were clarified after the staining. Finally, here he is next to 28mm Front Rank Dutch Lancers and a 120mm Verlinden Polish Lancer which were painted several years ago. Played out a scenario loosely based on the last battle in the movie "The Last Samurai." Slightly modified Bolt Action was used for the game with very good results, in my opinion. It played out fast and felt fairly balanced - even though the rebel Samurai forces were without modern weapons. Indeed, the only missile weapons they had were bows with 18" range versus the Imperial troops 24" rifle ranges. The Imperial troops also had two cannon with 36" range and two Gatling guns with 30" range. As the latter weapons were on a bluff they could fire over their own troops most of time. 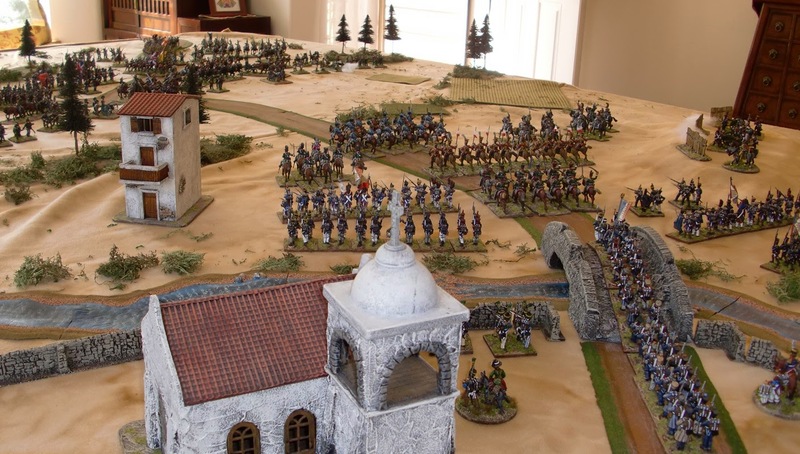 Rebel Samurai forces at the start of the game. All the figures are Old Glory except for two Bac Ninh command figures manning the guard towers and the Perry foot Samurai. Imperial troops in skirmish line with infantry in the center, cavalry on the flanks and supported by artillery and Gatling guns on an overlooking bluff. All of the figures are Old Glory, with the two Gatling guns made by Black Tree Design. The end of Turn 1 had most of the troops using Run to close in on each other - all missile troops, including artillery being still out of range. This was only found out after the first Imperial cannon discovered this fact after choosing to Fire. The rest chose Ambush when their die came up. Turn 2 had some Imperial troops able to fire on the rebels. Not causing too much casualties, but giving them Pins to deal with. 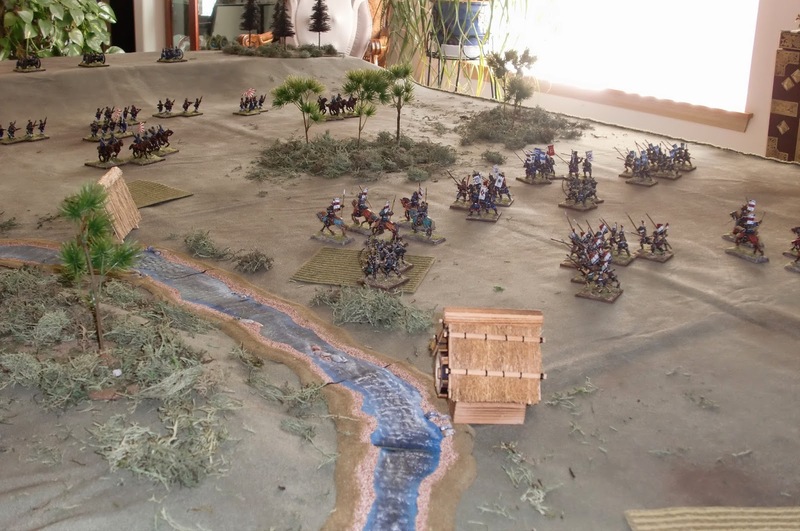 A mounted Samurai unit being decimated by carbine and rifle fire after impetuously trying to close in on the enemy. For their part, ashigaru bowmen were pretty effective even with a more limited range. Finally able to reach the enemy, the Samurai cavalry forgot the Imperial cavalry also had two attacks each in Close Combat. A large ashigaru unit overpowering another Imperial cavalry unit which has been reduced by ashigaru bow fire. The rebel left flank moving up in good order, and still out of Imperial artillery range. 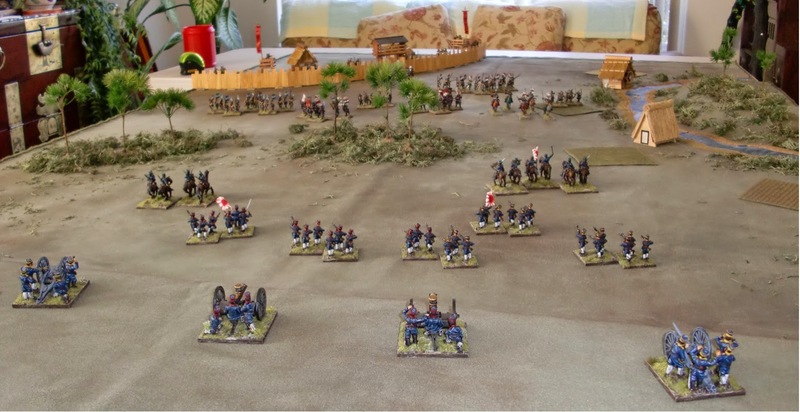 A foot Samurai unit, also with two attacks each engages Imperial infantry, while a mounted Samurai unit takes on another Imperial unit to their left. It was wasn't as lopsided as expected, as the Imperial infantry had some good die rolls. More infantry combat with both units having sustained earlier missile fire. The skulls are casualty counters, and the die represent Pins. Although it may look grim for the Imperial troops, the Samurai need 6 ' to hit with 3 Pins accumulated. The center of the battle at the bottom of Turn 4. Quite a few of the Imperial forces having been wiped out - only the artillery and Gatling guns atop the bluff remain unscathed so far. 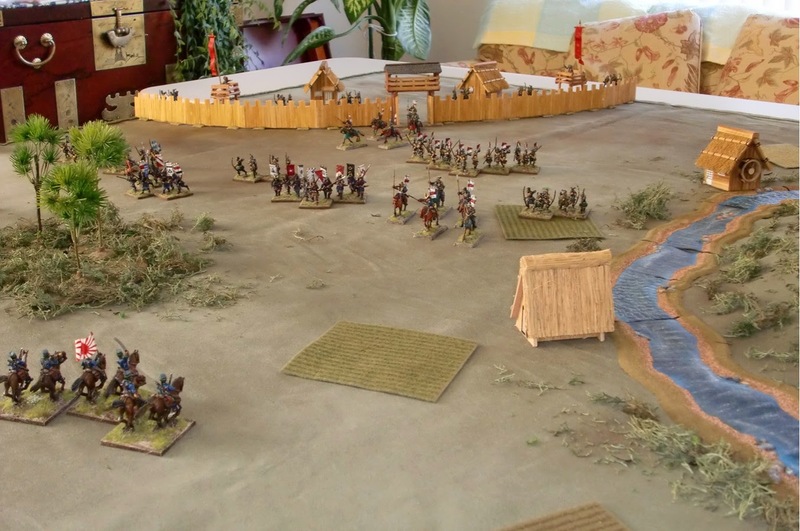 Turn 5 had the remaining Samurai cavalry unit making a charge on a cannon - they fell short and became targets of opportunity for the intended victim. The cannon used its Ambush setting to opportunity fire, but only caused one casualty. The next die went to the Gatling gun next to the cannon, which caused several more casualties - leaving only a pair of Samurai left in the unit. The battlefield at the end of Turn 5. The few Imperial troops still engaged in combat will likely be destroyed in the next turn. One of the artillery crew actually fell victim to ashigaru bowmanship - they rolled 6 twice for the hit - having Advanced and having two Pins and being long range! The game was called before starting Turn 6 - which would likely go to the rebels since they had most of their units still intact - including several bow units. Although there was also the chance the Imperial guns could've inflicted enough casualties to prevent this. Again, I was very pleased with the way Bolt Action's core rules adapted very nicely to this scenario with "Natives" lacking firearms. 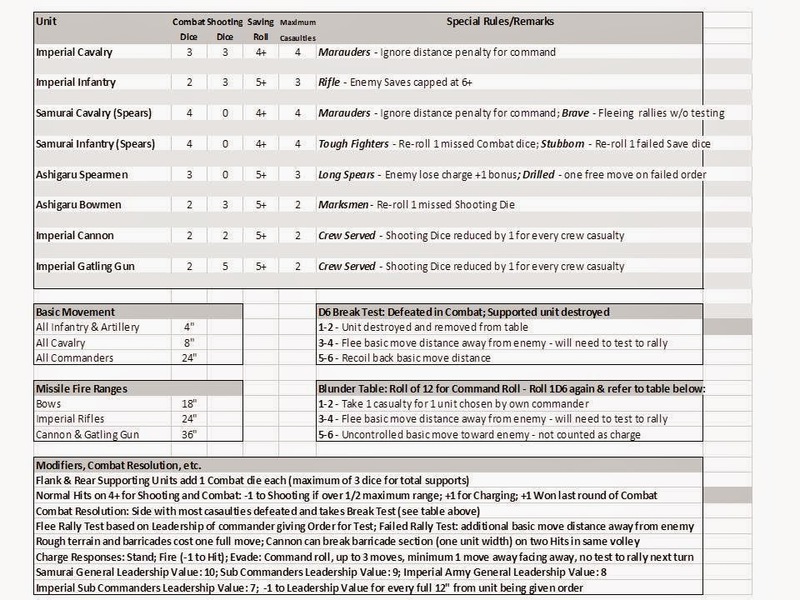 The previous blog post has a copy of the draft rules which were used. Fielded the troops for this scenario based loosely on the final battle scene from "The Last Samurai Movie With Tom Cruise." 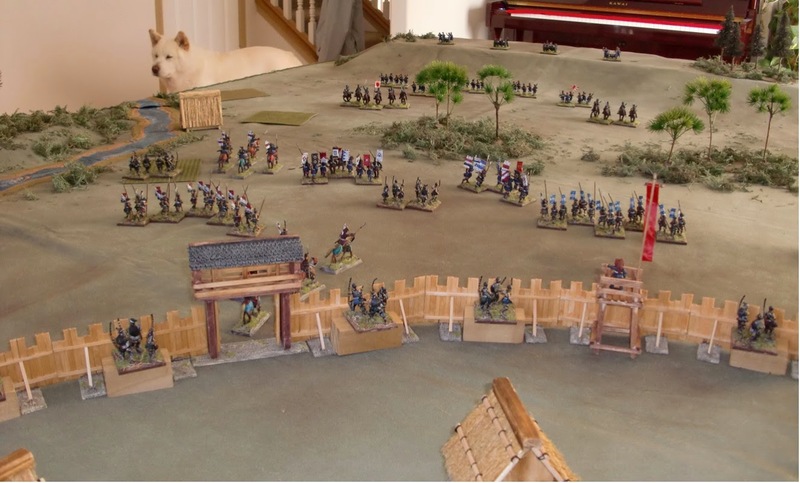 The Imperial troops have somehow surprised the "rebel" samurai at their fortified village. The samurai (and ashigaru) are in the process of reacting to this by streaming out of the village in clusters. 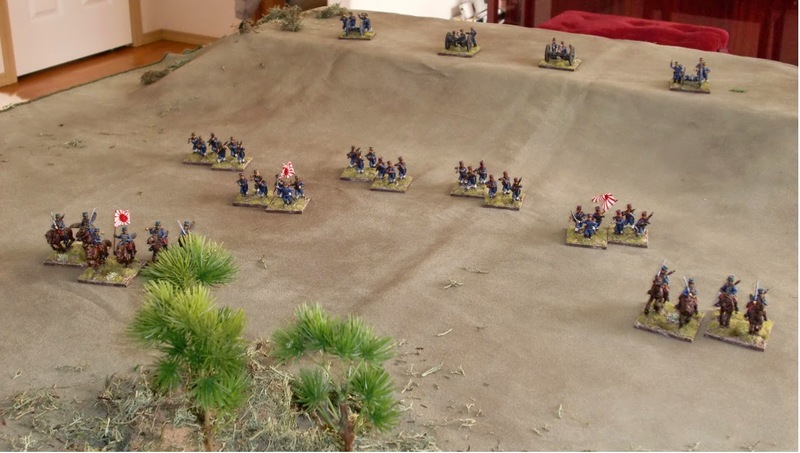 Sparse woods provide a little cover for the samurai from the artillery and Gatling guns atop a small bluff overlooking the village. 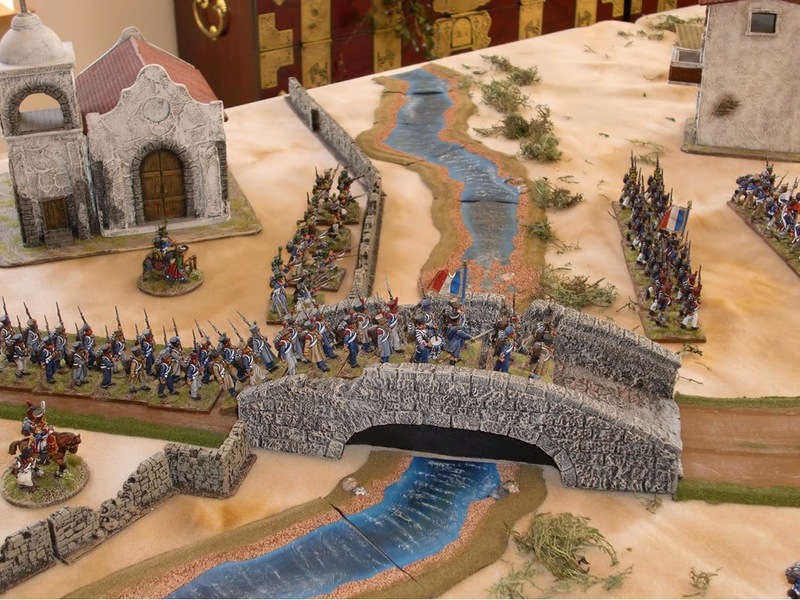 These are, of course, staged shots, prior to the actual play test, but I find it useful to see how the troops and terrain can work together prior to the game. I plan to try it out with modified Bolt Action rules. As mentioned in a previous post, it should also work with Black Powder or Hail Caesar modified. Although there are less Imperial troops than samurai, their fire power, notably the artillery and Gatling guns should balance the game. The only missile weapons the samurai have are bows, but their spear armed brethren have two attacks each in close combat. 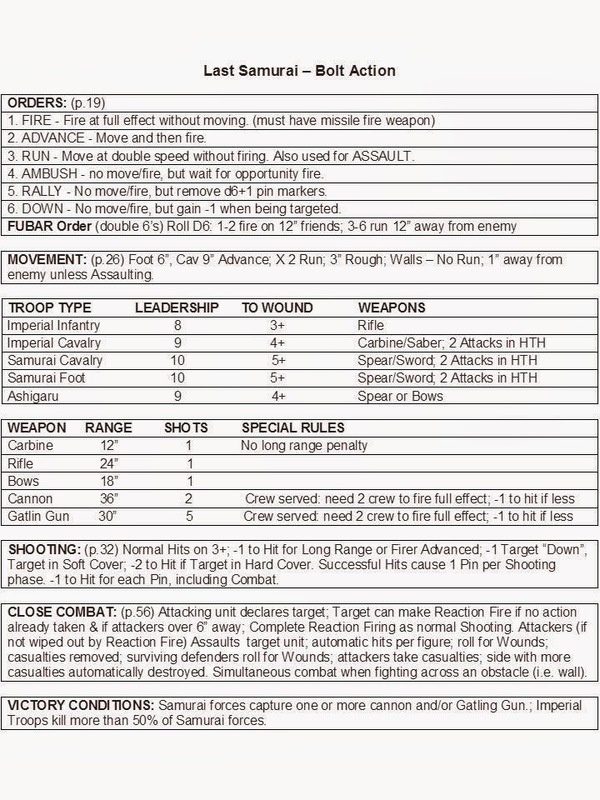 They are also harder to wound (or Damage in Bolt Action terminology) due to their skill and armor. The samurai units are larger to hopefully buffer the expected casualties suffered from Imperial rifle fire prior to engaging in hand to hand combat. Hopefully the Imperial artillery and Gatling guns will be effective prior to the infantry and cavalry contacting the samurai. An update after the play test will follow. Until then, I've added the draft Bolt Action and Black Powder QRS's (both modified & simplified). A couple of Gatling Guns for a Last Samurai scenario. The guns are from Black Tree Design's Zulu War range. The sitting figures have their heads replaced with those from Old Glory's Boxer Rebellion range. The rest of the figures are also from Old Glory - spares from the Artillery Crew set. The magazines on top of the gun are the Broadwell Drum type introduced in 1872. However, the type shown in the movie are vertical box magazines. Hollywood" accuracy" aside, these BTD guns were 25% off, so I couldn't pass them up. They arrived surprisingly fast too - only about 3 days after I ordered them from Texas. Perry makes some nice Gatling Guns too, but they are a bit more expensive, and I wasn't too stuck on high-quality as the OG figures are a bit crude anyway. They were painted up very quickly and given a Minwax stain, followed by a finish of Testors Dullcote. Although Black Powder would work very well for this period, I don't have too many figures, so plan on trying Bolt Action for it. There will be about 12 units per side - which is how many dice I have for each side. More to follow on this. Interestingly, two Gatling Guns were used by Tokugawa forces against Imperial troops at the Battle of Hokuetsu in 1868. The guns had been purchased from Prussian businessmen by the Daimyo of Nagaoka, Makino Tadakuni. These can also be used against my Choson Korean guys for the Donghak Peasant Revolution in 1894-95. 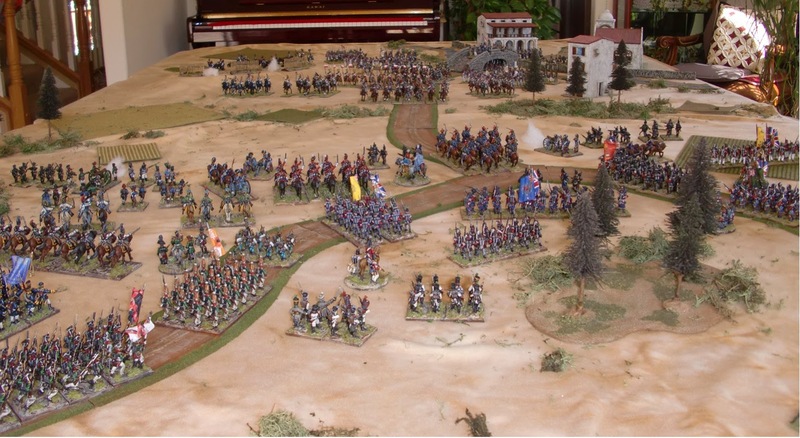 The Battle of Toulouse. Wellington commences operations on April 10 (Easter Sunday), 1814. Soult holds until April 11, and then evacuates the city. Wellington enters Toulouse on the morning of April 12, by afternoon he hears of Napoleon's abdication. These are mostly staged shots while working out the scenario using simplified Black Powder rules - removing stuff like Shaken and Disorder which tend to make me think too hard. Basic movement and ranges are reduced, and Blunder and Break Tests are simplified to three results each. 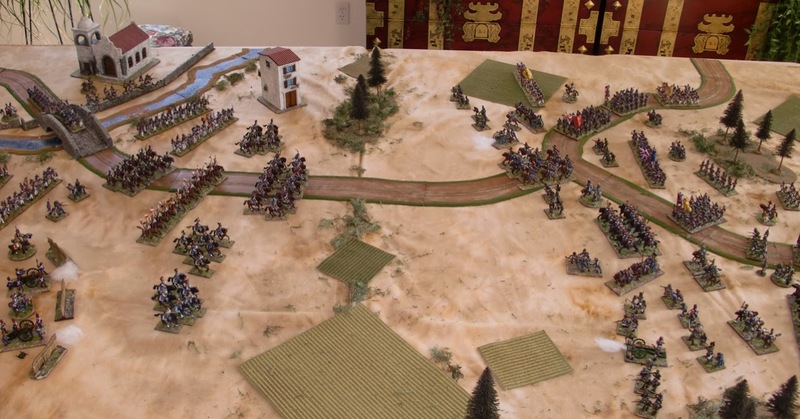 The El Perez (or El Perry) scenario in the main rule book could be followed, with the French making the retreat off table instead of the British. However, it could just as well be an attrition scenario. View of the French cav leading the attack with the St. Sypiere Redoubt to their rear right, and the Languedoc Canal and the outskirts of Toulouse to their left rear. View of the Allied advance from the north. Their left flank composed of Spanish and Portuguese troops - actually Russians, Prussians, Austrians and several other types as stand-ins. A view from the east of the battlefield proper. 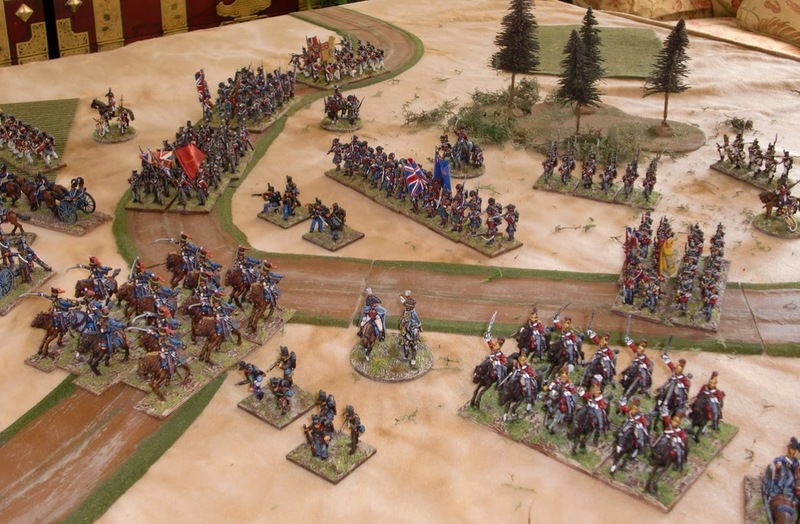 The French cavalry at this battle actually only consisted of the 2nd Hussars (these are 9th), and Chasseurs a Cheval. 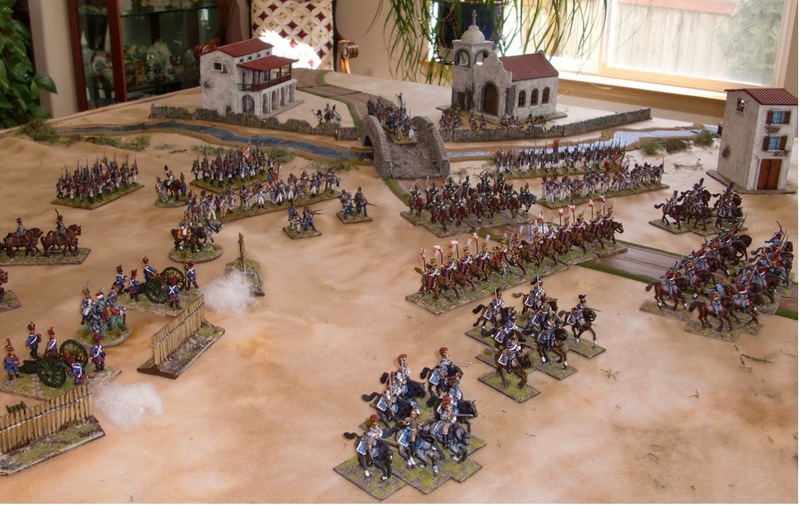 But in the spirit of the rules, all available cavalry are thrown into battle - including Dutch Lancers, Dragoons, Cuirassiers and Carabiniers! At least the latter three are in small units. The British have two good cavalry units - the 1st King's German Legion Hussars and Life Guards; both present at the battle. 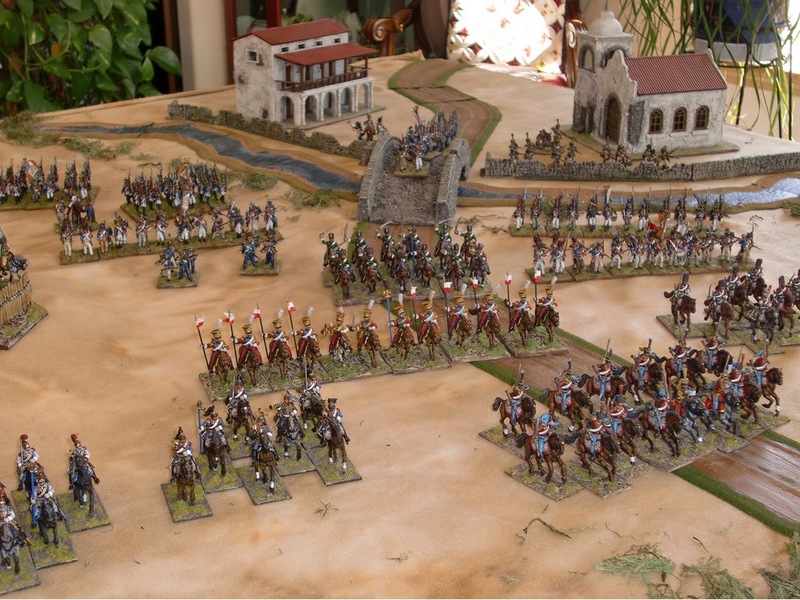 The Russians...er, Spanish also provide several cavalry units, including heavy and light cavalry. 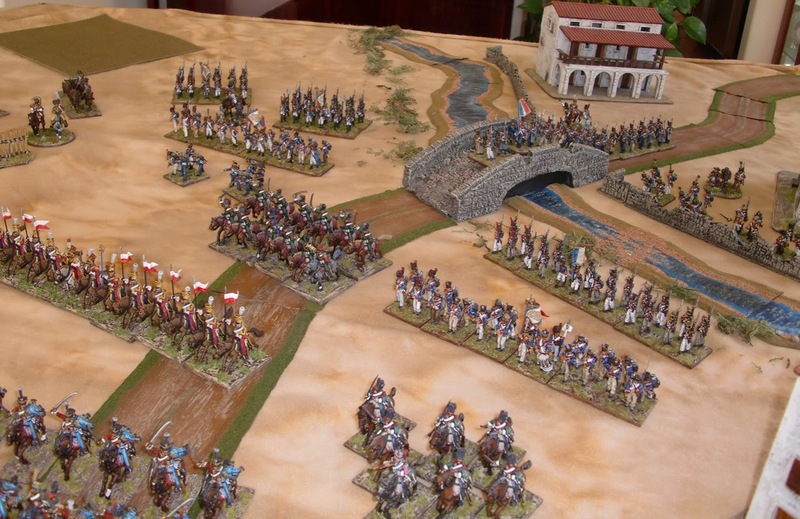 Oh, and those may look like Prussian Landwehr and Russians, but I assure you they are Spaniards. They were notorious in coming up with uniforms which are poorly documented. The Spanish holding the Allied left - oh, and check out the spiffy uniforms, which almost look like Bavarians. The militia/guerrillas next to them prove they are all Spanish; Or possibly Portuguese. 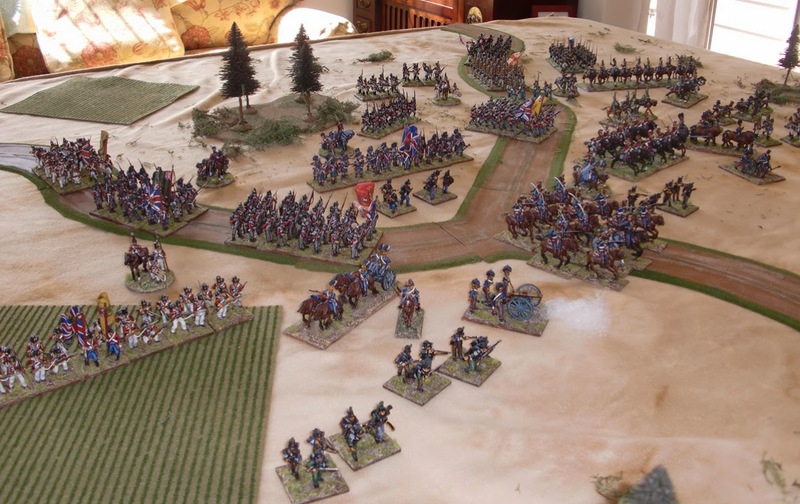 The British right - 95th and 60th Rifles out front screeing - as well as Royal Horse Artillery. The 3rd "Buffs" in line, with the Coldstream Guards leading the 79th Highlanders and 28th Foot in column. The 42nd Highlanders in the center in line, with a small unit of Royal Welch Fusiliers behind them; and the 71st Light Infantry in column on their left. 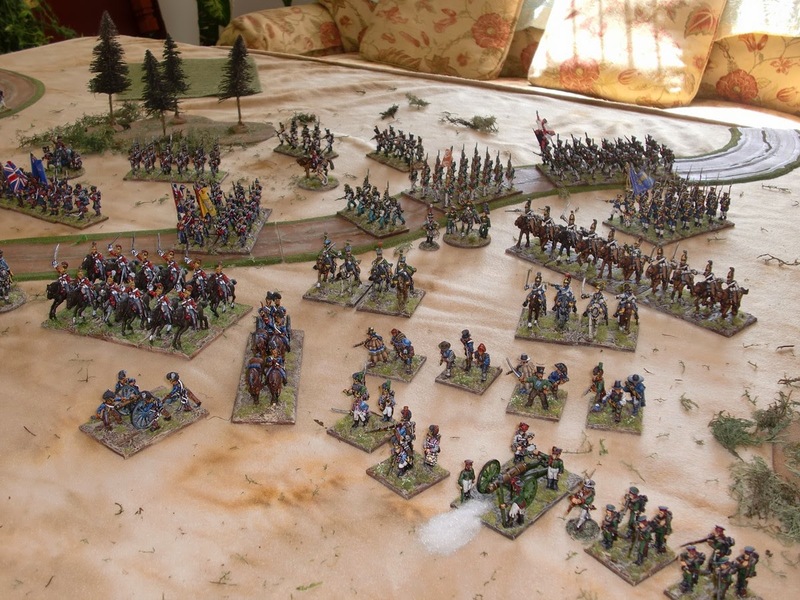 All of these units, except for the Coldstream Guards, were present at this battle. Back to the French. 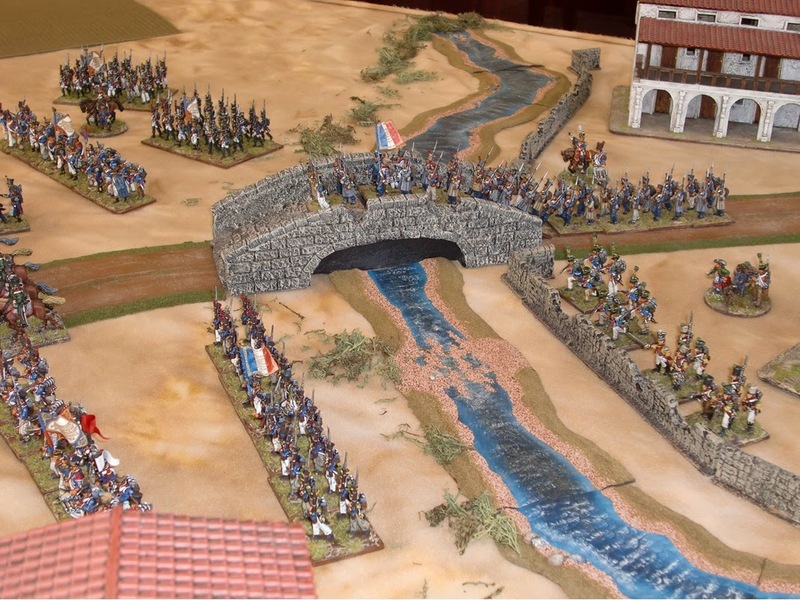 Here is their left flank forward the canal. 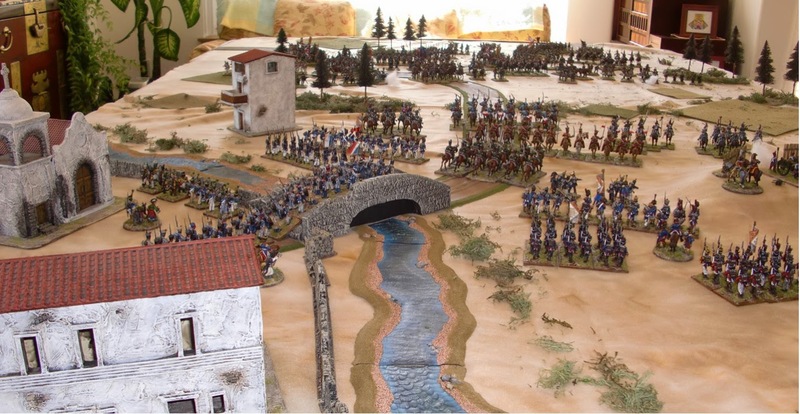 Neuchatel Battalion and French Voltigeurs remain inside the city's fortifications, while the 9th Legere cross the bridge towards the battlefield. 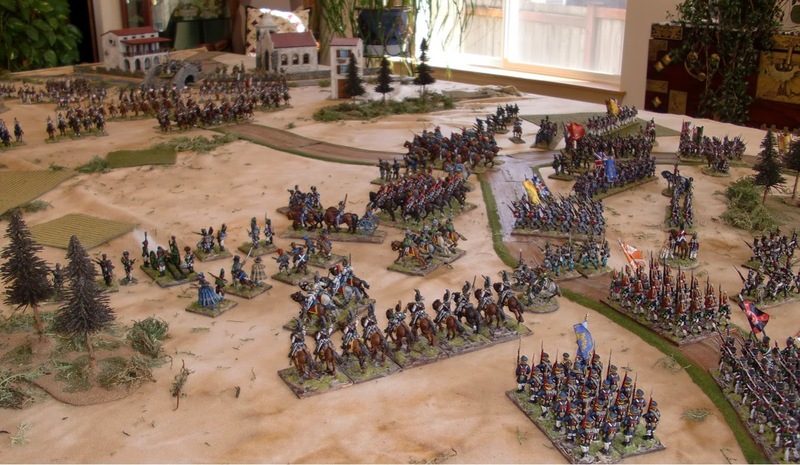 In the foreground and distance are other French infantry - including the 4th Swiss furthest away. Of course both the 4th Swiss and Neuchatel Battalion no longer existed in 1814. The 4th Swiss virtually wiped out during the Russian Campaign, and the Neuchatel Battalion during the 1813 campaigns. The 9th Legere, who were present at the battle, cross over the canal. A lone vivandiere, unfazed by battle, plying her wares in the shadow of the church. View towards the north with the approaching Allies in the distance. 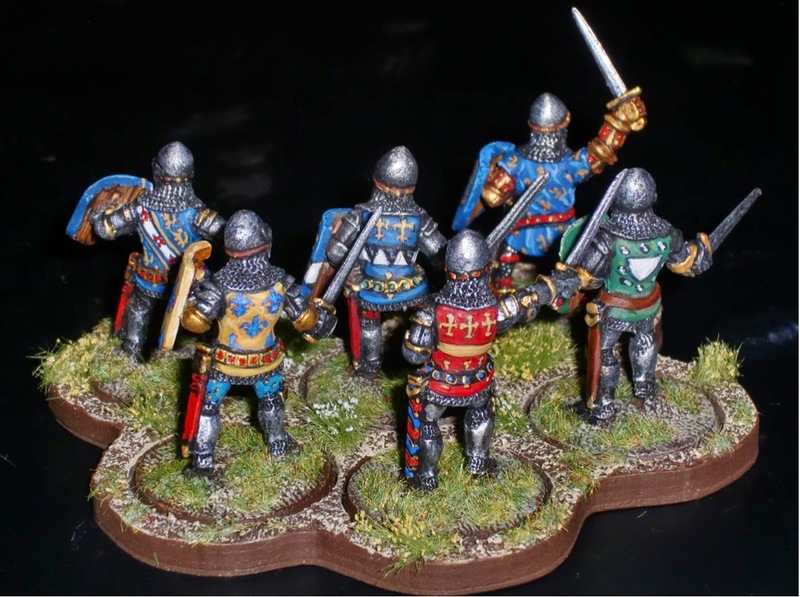 Here are some group shots of the six BTD knights recently painted - just enough for another foot MAA unit in Lion Rampant. In the photo below they are from left to right, front row: Günther von Schwarzburg, King of the Germans; Sir William de Aldeburg; Sir William de Bohun, 1st Earl of Northampton, KG; rear row: Sir Thomas Erpingham, KG; Thomas de Beauchamp, 12th Earl of Warwick, KG; Pietro Farnese - Captain General of the Papal and Florentine Armies. 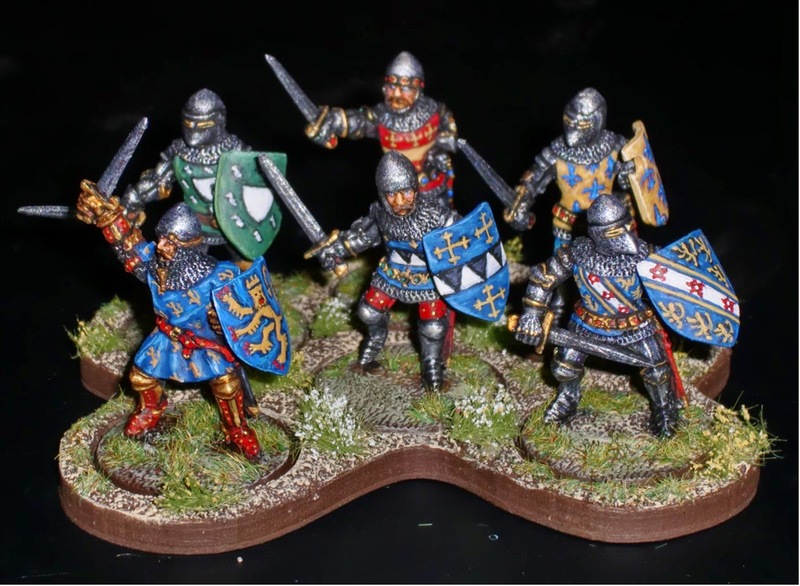 They are all on 25mm magnetic round bases from GF9; the horde tray is from Litko. Except for the Schwarzburg figure who's from the Early-HYW foot command pack, they are all from the Late-HYW packs. Still deciding on who the six remaining unpainted knights will be.